The adventurers are living 62 feet (19 meters) underwater inside the Aquarius research station — which is about 3.5 miles (5.6 kilometers) from Key Largo — on an undersea mock asteroid mission that began June 11. It's the 16th expedition of the NASA Extreme Environment Mission Operations program, or NEEMO. 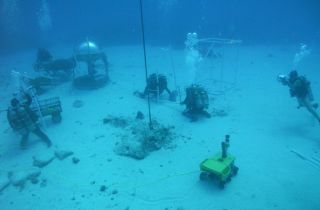 The main goal of NEEMO 16, which wraps up on Friday (June 22), is to help NASA prepare for a manned mission to a near-Earth asteroid, a key priority for the space agency. In 2010, President Barack Obama directed NASA to work toward getting astronauts to a space rock by 2025, then on to the vicinity of Mars by the mid-2030s. Metcalf-Lindenburger talked to SPACE.com while outside Aquarius, on a simulated spacewalk. She and the other three aquanauts — European Space Agency astronaut Timothy Peake, Japanese spaceflyer Kimiya Yui and Cornell University professor Steve Squyres — are spending a lot of time out in the water. "We have a very aggressive spacewalk agenda," Metcalf-Lindenburger said. "We are doing two people out the door in the morning and two in the afternoon, which requires at least one person being the crewmember inside speaking to the spacewalkers." "We've looked at tethers that were tightly pulled, and we've used what we call a boom, which is basically a long pole," Metcalf-Lindenburger said. "I gotta tell you, it's a lot of fun." Squyres, who is the lead scientist for NASA's Spirit and Opportunity Mars rovers, is also having a good time on NEEMO 16. In a recent mock spacewalk, he fastened his feet to a small submarine, then was driven around from spot to spot. This technique (with a spacecraft substituting for the sub, of course) could be used to help astronauts explore an asteroid while keeping their hands free. So the exercise was a useful one — but it was also a lot of fun, Squyres said. "I would be remiss if I didn't say something about the cool factor in all of this," he wrote in a NEEMO 16 blog post Sunday (June 17). "At the start of today's EVA [extravehicular activity], I was floating above the bottom, listening to the voice communications in my headset and watching for the sub. Slowly, almost imperceptibly at first, I saw the lights coming toward me through the blue mist. It was like being inside a science fiction movie. And then, once we were flying about the surface — man, I've never experienced anything like it." Aquarius is the world's only undersea research station, according to NASA officials. It's owned by the U.S. National Oceanic and Atmospheric Administration and managed by the University of North Carolina at Wilmington. The research station sits on a sandy patch of seafloor next to coral reefs in the Florida Keys National Marine Sanctuary. So the aquanauts share the water with lots of intriguing wildlife, including colorful reef fish. "I love being out here in the water," said Metcalf-Lindenburger, who flew on the space shuttle Discovery's STS-131 mission in 2010. "Usually we're so focused when we're doing our work outside that we don't get to really appreciate the fish around us. But the fish out here this morning are just super-interesting, and it's really just a pleasure to be out here." Before sending humans into deep space, "we would want to have a good plan," she said. "We're doing some of that early work, so that we'll have a good plan when we go to explore an asteroid."